Fabulous tour! Claudio, Antonio and Melanie were Awesome!!! Expected to see more body casts though, we only saw 1. Pompeii was amazing. The guides were great. The only thing that was disappointing, was we were unable to go to Mt. Vesuvius and as a filler, you added the archaeological museum and just dropped us off at 2 p.m. when we weren't supposed to return until 5:30!I feel we were shorted, plus no guide for what was suppose to be guided. We should have been given an option or compensated and returned to original pickup place. instead, we had to take the Metro! Chez (spelling ?) was very pleasant and helpful. Going to Mount Vesuvius first in the morning was brilliant because the weather was a little cooler. The walk was challenging but he told us that before we started. Lunch was really nice at a local winery. The wine pairing with each course was a nice touch. That afternoon we went to Pompei and was educated by a wonderful, interesting guide named Bernadette (I think). She was a wealth of information. We loved it. The Pompeii tour was amazing and very informative. It involves a bit of walking but very much worth it. Mt. Vesuvius tour was a little disappointing, but not due to the tour company. An unforseen natural event took place and was not able to fully view the volcano. Lunch and wine tasting, however, was simple splendid. We especially enjoyed the wine tasting. The main reason I chose this tour was for the winery on Mt Vesuvius and it did not disappoint. The winery was beautiful with the mountain rising in the background and the wine tasted really interesting no surprises that it's from a volcano area. The lunch was also superb - a three course meal with wine served throughout. The tour guides were also a lot of fun, particularly our guide on the coach and our guide in Pompeii. Both were very knowledgeable and had a great sense of humour. They made the tour a lot of fun and very interesting. It was a nice touch to have a glass of wine from the winery at the top of Mt Vesuvius! It was well deserved after a tough climb in the heat/direct sun. Left from the Naples train station, easy to find meeting point. Pompeii was just amazing and we had such a great guide. I don't have his name but he was the cutest ,older gentleman, highly educated and informed on Pompeii, and had jokes for us all! I believe he was born and raised in Pompeii which gave him a difference perspective I believe. The winery was nice with lunch. Not much wine given for the tastings but wasn't a big deal. Mt. Vesuvius was interesting and I recommend walking to the top to see not only what the crater looks like but the views. We had a great day and came away feeling way more educated on this area! This tour was an incredible experience! Our group consisted of only 3 people and our guide, Cesare. Starting at the Starhotels Terminus, our driver, Pasquale, safely brought us in a private car to Pompeii 15-20 minutes and heard some interesting facts about Naples, Pompeii, and Vesuvius. 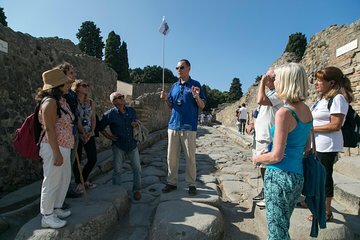 When we arrived in Pompeii, we met our personal guide, Giorgio, who showed us through a section of Pompeii you would need several days to see everything. Giorgio was amazing and set himself apart from other tour guides as we went to areas where larger groups could not go as he shared interesting facts about Pompeii and the innovative Romans. At the end of the tour, Cesare picked us up and showed us a cammeo shop where we got to see an artist making cammeos by hand. After a brief period of free time where you can taste limoncello and browse surrounding stalls be careful of the aggressive sales tactics of the merchants on the street, Cesare/Pasquale took us to Cantina del Vesuvio where we got a short tour of the winery followed by wine tasting and lunch. The food, wine, and view of Mt. Vesuvius alone was worth the price of the entire tour! Following lunch, Cesare/Pasquale took us to the highest point on Mt. Vesuvius where vehicles can go before allowing us plenty of time to hike to the summit for a breathtaking view of the Bay of Naples!